I'd hate to be a fan of the Tornoto Blue Jays. Having to watch Roy Halladay be dangled in front of the division rival Red Sox like that, it has to hurt a little. I couldn't consciously be a fan of the New York Mets. Second highest payroll in baseball yet sitting ten and a half games back of the division lead? But being a fan of the Pittsburgh Pirates, well I wouldn't wish that on anyone. After losing five straight and seven of their last ten outings, the Pittsburgh Pirates front office gave up. 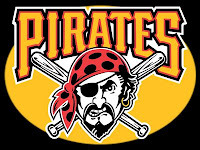 Currently 15 games under .500 and firmly implanted in the cellar of the National League Central, the Pittsburgh Pirates have dismantled any shot at putting a competitive group of players on the field this season and for the coming season(s). The Steelers have captured two NFL Championships over the past four seasons. The Penguins not only played in two Stanley Cup Finals in back-to-back years, they won one this past June. The Pirates however, they've taken it upon themselves to be Pittsburgh's worst and they aren't looking to give that title up any time soon. Bank on it. Playing pawn. With the Dodgers desperately needing an impact bat and the Red Sox desperately needing to part ways with super-slugger Manny Ramirez, the Pirates step in to get the deal done. Pittsburgh sends their all-star outfielder Jason Bay to the Red Sox and the Red Sox send the Dodgers the slugger they coveted, what did Pittsburgh get in return? A young outfielder the Red Sox didn't have that much faith in, judging by his .250 BA this season they were correct about Brandon Moss. Craig Hansen, the Red Sox first round blunder which had yet to pan out, oh and did I mention he's currently on the 60-day disabled list? Dodgers pitching prospect, Bryan Morris, who'd already been through Tommy John surgery prior to landing in Pittsburgh. If your a fan of the Pittsburgh Pirates and you watched the 2008 postseason which featured the Red Sox & Dodgers in their respective League Championship Series you had to get angry, real angry. That deal probably doesn't get done if the Pirates don't step in, those teams may not have had the success which they did, and you still have Jason Bay in a contract year. Playing pawn isn't exactly where you want your team, in any way. Straw that broke the camel's back. The Pirates send standout outfielder, Nate Mclouth to the Atlanta Braves. For the second straight season the Pirates send an uber talented outfielder to a contending team. Yet this time it's different. Shortstop Jack Wilson publically criticizes the organizations move. Wilson expresses that not only him but other teammates are overly upset at the dealing of Mclouth. Rightfully so, the Pirates are making no effort to improve their day to day roster yet continue to rebuild with young players and then trade them off for more young players without ever opening the checkbook. Only two months into the season and the Pirates move their best all around player. After Wilson's public jabs the Pirates fire back with this "they are professionals, we expect them to come out and play like that." Mclouth wasn't entering a contract year, Mclouth was already signed up at reasonable dollars. As for the Jack Wilson and others (just wait) the writing is on the wall. Your next. Deadline, Flatline. Middle in-field out. Wednesday the Pittsburgh Pirates trade both middle infield all-stars Jack Wilson and Freddy Sanchez. First off, after contract negotiations for both middle infielders were stalled a week ago, the only thing we were waiting for is where they'd be headed. After two low-ball offers from the Pirates organization and watching what played out in the Mclouth trade, neither of these infielders were signing on. While the Sanchez deal to San Francisco gives the Pirates some good minor leaguers, isn't this repeating the past? Any time you lose a 3-time All-Star and former batting champion whose only 31 years old, the trade isn't on your side and that is what the Pirates have just done. As for Wilson? The Pirates had no intention on picking up his $8 million dollar option for the following season, as a Pirates fan you have to wonder why hanging on to your veterans who can still produce isn't an option. Having your team gutted year after and year and watching your stars play for contenders has really got to be the form of fan hell that exists in fandom. At least Cleveland goes deep once every five or six seasons. In Pittsburgh, its a rebuilding project that has never been, rebuilt.